Lately, I’m reminded why I write—why I write my blog and why I wrote my novel East of Mecca. One reminder came April 17. I was at a concert at SPACE, a local venue, when a woman asked if I was “Sheila.” When I said, “Yes,” she said she’d read my book and recognized me from my picture. This was the first time anything like this has happened to me, and I was surprised and pleased. She said lovely things about East of Mecca, but also told me how much she liked my blog posts—how they spoke to her on a personal level—that she recommended my blog to friends. 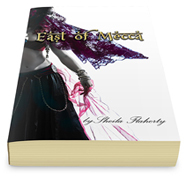 Then she said, “You haven’t written much in a while.” I agreed, “It has been a while.” When I asked her name, I realized she had written a wonderful review on Amazon back in January, giving East of Mecca 5 stars. I thanked her, hugged her, and walked away feeling elated. Sherry Swaggart made my day! While it felt cool to be recognized, and I was thrilled she loved my book, what impacted me the most was that Sherry found my blog to be personally relevant. That is what stayed with me—the importance of my mission to enlighten, inspire, and empower my readers. I have also been reminded of my mission in a way that may sound “crazy.” Recently, I’ve often been aware of the scent of Clementines. It usually happens early in the morning, when I’ve just awakened, but haven’t stirred or opened my eyes. I sense energy— an almost imperceptible weight of a presence. “Yasmeen,” I think to myself. And I’m not alarmed. Being a psychologist, I’ve always known the power of words—to heal and to hurt. But when I was writing East of Mecca, I learned about the power of words in the form of story—to create and to conjure. I had a ritual around writing—usually at night after the world had gone dark and quiet. I poured a glass of red wine, lit candles, and slipped on my abaya and scarf. Sometimes I even fastened my khalakhil on my ankle. I put on Middle Eastern music and danced. Swaying to the music, I found myself back in the story and back in Saudi. Night after night, I performed this ritual. It was always the same—until it wasn’t. One night, deep into the book, I was dancing in my living room. My eyes were closed and I was feeling the music and the passion of my story. Suddenly, I sensed a strong presence. I opened my eyes and in front of me was the transparent, shadowy silhouette of a woman in veils and abaya. I felt the energy and my heart raced. I felt chills, but I wasn’t cold. And I wasn’t afraid. But my cat Blue was! Before I could think I was imagining the form, Blue leapt from his spot on the sofa and raced up the stairs. She stayed with me awhile, and then was gone. The scent of Clementines lingered in the room. Writer’s often say, “My characters take on a life of their own.” That night I learned the extent to which that is possible. While Sarah’s story in my novel is inspired by my experiences, Sarah is fictional—as is Yasmeen. But Yasmeen represents all the women whose faces and bodies are shrouded in black and whose stories beg to be told. The brilliant author Khaled Hosseini said the women in his novel A Thousand Splendid Suns represent the “collective spirit” of the women he met while in Kabul, Afghanistan. His words are the perfect definition of the spirit of Yasmeen I have conjured—and of Sarah. Since that night, I have often felt Yasmeen’s presence. When I got blocked and couldn’t write, I called on her help—and she appeared. When, of late, I’ve felt the weight of her energy and smelled the scent of Clementines, I’ve known she is reminding me to get back on my path—nudging me to get back to work pushing her story into the world. And I believe she is also telling me to keep writing my own stories. Because, thanks to all the feedback I’ve gotten from readers of my book and readers of my blog, like Sherry, I know my voice is heard. Today, I put on Middle Eastern music, lit a candle, and wore my abaya and scarf as I wrote. Yasmeen came to me—and the words flowed for the first time in months. This is awesome sis! You’re sooo creative! Good luck in writing the next book?! Thank you for sharing such a vulnerable and magical moment. This is a powerful post for writers but also for those in touch with a more spiritual realm where we are all connected. Thanks for making me pause today.